This is a printed one page article written by the former mayor of Timmins, J.P. Bartleman (1936-1939). Dated July 25, 1940. It is entitled, "Who are the men actively engaged in an effort to secure the release of Leo Mascioli?" and was written as a response to a dispatch printed in the Timmins Daily Press newspaper on July 23, 1940. 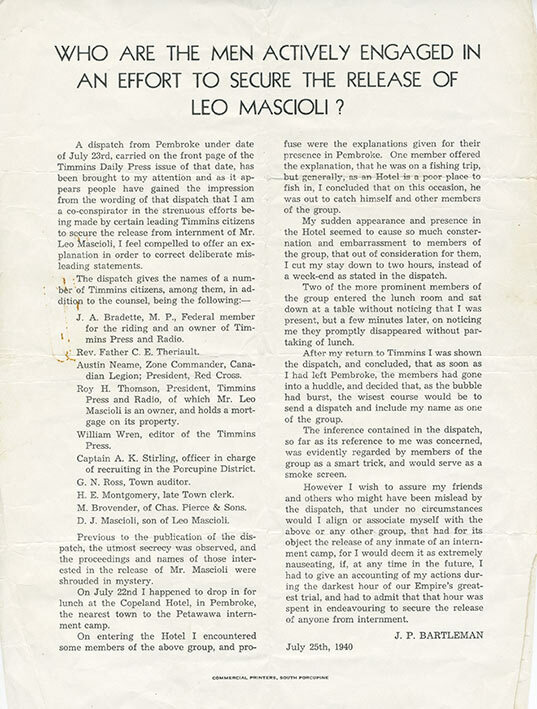 Here, Bartleman clarifies that he is not a "co-conspirator in the strenuous efforts being made by certain leading Timmins citizens to secure the release from internment of Mr. Leo Mascioli." He does however, mention the men who he knows are involved. On one occasion Bartleman saw one of the men in Pembroke (the town where internees' trials were held) and was told by the genteman that he was on a fishing trip. Bartleman suspected that the gentleman was lying as several of the other men in that group were also present. According to www.TimminsToday.com, Bartleman is number seven on the top ten mayors of Timmins. It notes: "The boom town of Timmins was rife with gambling, bootleggers, hookers, and saloons that were all trying to capture the attention of thousands of men and women for a quarter century. The town was also developing a well-deserved reputation for corruption. At one point in the early 1930's nearly the entire Timmins Police force was fired and replaced. Bartleman, a long-time town councilor, was seen as 'the cleanup man'." As a former mayor with a good reputation, Bartleman wanted everyone to know what his viewpoint was on the internments and Leo Mascioli. He concludes: "I wish to assure my friends and others who might have been mislead by the dispatch, that under no circumstances would I align or associate myself with the above or any other group, that had for its object the release of any inmage of an internment camp, for I would deem it as extremely nauseating."